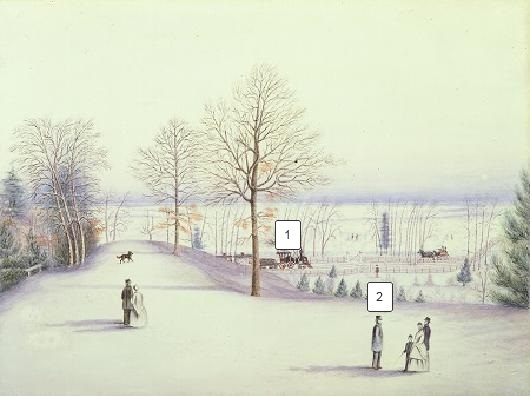 The 1850s marked the dawn of the railway age in Toronto and Canada West. Trains drastically reduced travelling times to inland cities which facilitated both tourism and industry. Goods could now be transported to markets in northern Ontario by rail, transforming Toronto into a thriving manufacturing center. Door of John Howard’s Art Supply Cupboard at Colborne Lodge. 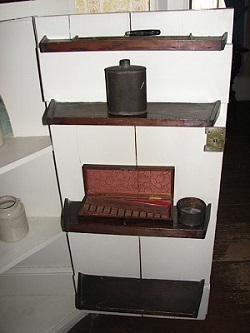 A corner cupboard in the library of Howard’s home housed his art materials, as shown with sample artifacts in the above photo. In 1876 Howard constructed a picture gallery on his property to display all of the artwork he or his wife collected, created or copied. The Howards’ art collection is on rotating display at Colborne Lodge throughout the year.